Music therapy is a form of therapy that uses music to achieve non-musical goals. Like traditional therapy, music therapy uses various techniques to achieve motor, behavioral, cognitive, and emotional goals to promote healthy aging. A music therapist is not just a person who can play guitar and sing. Music therapists in the United States must have a bachelor’s degree in music therapy as well as 1,200 hours of supervised clinical training. Post-training, one must take an exam of music and therapeutic knowledge. Once passing the exam, a music therapist will have the music therapist-board certified credential, or MT-BC. The difference between traditional therapies and music therapy is that the latter uses music experiences to facilitate and solidify therapeutic goals. Some goals for seniors are to promote self-expression, increase cognitive skills and gross motor movement, promote relaxation and ease symptoms of ailments a person may have. Music is one of the only things proven to work both hemispheres of the brain, improving cognitive function in older adults and tremendous rehabilitation from strokes and other traumatic brain injuries. Music therapy uses four musical techniques to achieve these goals. The first and most common kind in senior care is receptive music therapy. This kind of technique is most commonly used as a sing-a-long. During a session, a music therapist would play and sing songs from the client’s history and then reminisce about the clients past. 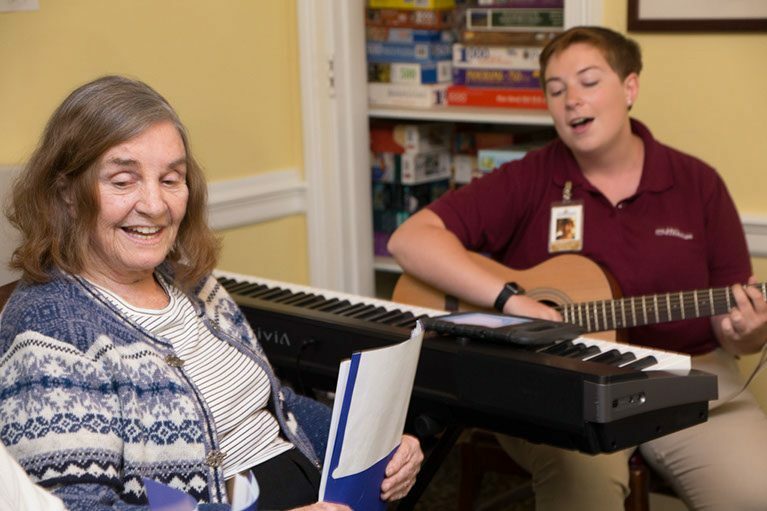 Receptive music therapy in the form of group sing-a-longs promotes a sense of community for residents and attendees to communicate and discuss similarities and differences. Listening to music can be a gateway into someone’s memories, even if they have a memory-impairing ailment. The second technique used with senior clients is re-creative. This technique allows for clients to not only sing along to the songs they sang in their past, but to add to it. This technique is used to help promote cognitive skills as clients are encouraged to write new lyrics or to add a new drum beat to a song they already know. This technique requires clients to work together to create something new, fostering a sense of community among the group. Improvisational music therapy is a technique where there are very little rules. Clients are given an abstract or concrete object, feeling, or image and are asked to play the music that sounds it. For example, a music therapist might say, “Let’s play what we think walking through the rainforest would sound like.” You might hear a rain stick or some bongos to mimic the quick pitter patter of animals scurrying around the forest floor. This imagery can transport someone out of their daily life and allow them to explore new and old places. The last technique used in senior care is compositional. Compositional music therapy is the creating of something new. Clients can reminisce about their lives and express their feelings and thoughts by creating a life song or CD. Individuals without any musical skills can work one-on-one with a music therapist to create a life song or CD to give to grandchildren, children or keep for oneself as a way of reliving some of life’s best moments. Music therapy is useful in a wide variety of populations. As medicine progresses and humans live longer, it is important to find activities and therapies that will help promote healthy aging and allow seniors to enjoy the years they have worked so hard for. For more information on music therapy, please visit www.musictherapy.org where you can find resources for families and a directory of music therapists who serve in your area. The Hickman is not affiliated with the American Music Therapy Association.